1. When placed on their tummies, babies who turn out to be left-handed tend to turn their heads to the left. In contrast, babies who turn out to be right handed turn their heads to the right. This may be coincidental, but it is a trend that is recurring. 2. Tom Cruise, Whoopi Goldberg, Paul McCartney, Oprah Winfrey, Justin Bieber, Celine Dion, Jennifer Lawrence, Brad Pitt, and Angelina Jolie all have dominant left hands. Many deceased celebrities, like Marilyn Monroe, Kurt Cobain, and Jimi Hendrix were left-handed too. Maybe being left-handed is the secret to success! 3. Okay, well we don't know for sure, but many artistic representations of Satan depict him as left-handed! The man in red is said to baptize with his left hand while the Christian church's blessings are performed with the right hand. The Latin word for "left" is "sinister," which could also go into why nuns used to force children to write with their right hands even if they were left-handed. 5. More bad press for the lefties, unfortunately. In the past, left-handedness was seen as a mark of the devil, a sign of neurosis, rebellion, and criminal activities. In fact, the word 'left' in English comes from the Anglo-Saxon word 'lyft', meaning broken or weak. 6. In historical texts regarding witchcraft in Europe, the left hand was the one used to cast spells and inflict harm on others. Witches could supposedly simply touch someone with their left hand to curse them. 7. It's not all bad news for lefties! St. Lawrence University conducted IQ tests among right- and left-handed people. The tests results concluded that there were more left-handed people with IQs over 140 than those individuals with dominant right hands. To prove it, Benjamin Franklin and Isaac Newton were lefties! 8. A behavioral test conducted in Scotland showed a correlation between left-handedness and embarrassment. Those who had a dominant left hand answered that they worried more often about making mistakes and were more sensitive to criticism. Overall, the study suggested that left-handed people are generally more hesitant. 9. When it comes to processing moods, some lefties showed an imbalance in processing emotions with the left and right hemispheres in their brains. Frequent bad moods may be a result of this. So if you find yourself or your friend getting a little overly angry in a situation, check your hands! 10. A survey of more than 25,000 people from 12 countries concluded that left-handed people drink more frequently than their right-handed counterparts. Luckily the research did not indicate that left-handed people were more prone to abuse alcohol. Lefties just wanna have fun! 11. Research has shown that left-handed people may really be more artistically inclined. There is evidence that lefties are better at divergent thinking, and a survey of over 2,000 left-handed people showed that the majority of lefties were drawn to careers in art and music. 12. In the 1990s, the UK-based Left-Hander's Club started the annual "Left Handers Day." Every year on August 13th, lefties around the world can celebrate their minority dominant hand. The purpose is to raise awareness about those who are living with a dominant left hand in a right-handed world. 13. The left hemisphere of the brain is used by both lefties and righties for language functioning. However, approximately 30% of lefties are partial to their right hemisphere. 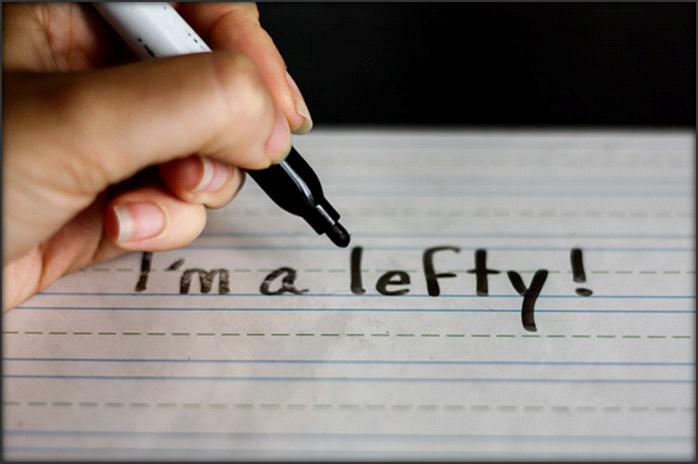 As a result, lefties run a higher risk of developing schizophrenia, dyslexia, or ADHD.